Where can I find Facebook analytics? To check your Facebook Page stats you need to fulfill one condition: your Page must have more than 30 fans. After this threshold, you’ll get access to Facebook Insights. Go to your Page through business manager. Click Insights in the top menu. There you go, you’ve just entered the fascinating world of Facebook statistics. Pretty big, eh? Lots of data to process, and most of it can help you improve your performance. You can learn more about the people you reach with your communication, your overall reach, the engagement of users etc. Sounds complicated? Make it simple by using third-party apps that will help you understand the data. Or, in case of Sotrender, you can even get tailored, personalised tips based on Insights data and processed by specially designed algorithms. 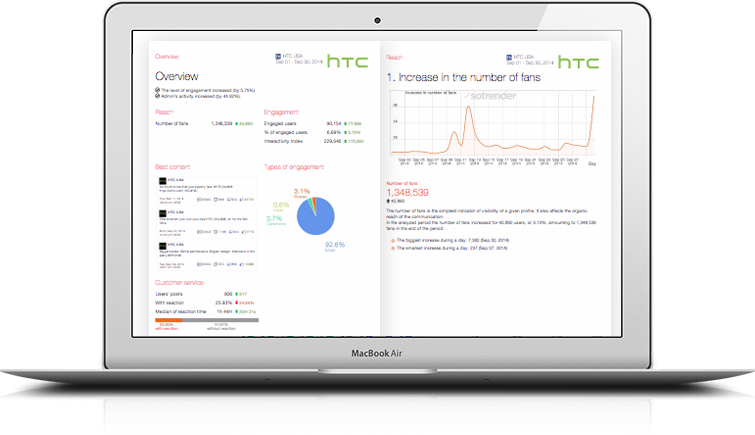 You’ll be presented with the data in a much clearer and more understandable way. Can Facebook help me with building brand awareness?